Kyle Sammin, March 7, 2019 – is a lawyer and writer from Pennsylvania, and the co-host of the Conservative Minds podcast. Read some of his other writing at his website, or follow him on Twitter at @KyleSammin. Last month, Colorado’s legislature became the twelfth to pass the National Popular Vote Interstate Compact (NPVIC,) an agreement among the states to circumvent the constitutional method of electing the president in favor of a national popular vote. Each state that signs the agreement would require its presidential electors to obey the results of the national popular vote, not the results in their own state. It would come into effect when states representing a majority of electoral votes have signed on to the idea. Colorado Gov. Jared Polis, a Democrat, has pledged to sign the bill. The idea has been capturing the attention of frustrated Democrats since law professor Robert W. Bennett dreamed it up after the 2000 election. It gained even more popularity on the left in 2016, following the election of Donald Trump despite Hillary Clinton’s popular vote plurality. As an antidote to the Democratic Party’s current difficulties in winning votes outside of their coastal base, the compact is bound to appeal to fed-up partisans. But as a legal matter, it is flawed and almost certainly unconstitutional. The way we change constitutional requirements like the Electoral College is detailed in Article V of the U.S. Constitution. 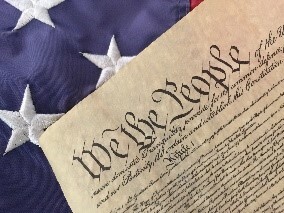 The amendment process described there gives several ways to change the Constitution, and may be used to bring about nearly any alteration the people desire. It was, in fact, used to alter the Electoral College process three times before. The first, in the Twelfth Amendment, approved in 1804, mandated that electors vote separately for president and vice president (before then, the vice president was the runner-up in the presidential election, a system that quickly became untenable). The Fourteenth Amendment, added in 1868, barred unpardoned rebels from becoming electors and requiring that states allow all of their male citizens over 21 years old to vote for electors (with a minor few exceptions). The Twenty-Third Amendment expanded the Electoral College to give the District of Columbia three electors in 1961. In addition, the Fifteenth, Nineteenth, Twenty-Fourth, and Twenty-Sixth Amendments expanded the right to vote generally, including in presidential elections. As all this makes clear, we are perfectly capable of altering the method of presidential election through the amendment process, and have done so often in our history. Why, then, would the advocates of a national popular vote not use that tried-and-true method of altering our political structures legitimately? The reason is simple: they have tried it before and failed. Instead of trying to build popular support, popular vote advocates are now trying to get around the law through this legislative sleight of hand. It takes more to amend the Constitution than it does to pass a simple statute, and purposely so. The Constitution is supreme over all other laws and state constitutions. As such, changes to it ought to be something that more than a bare majority desires. Laws come and go, but a Constitution is meant to have staying power and not be idly altered. The popular vote campaign does not have that widespread support. Time and again, amendments proposed in Congress to accomplish their desired result have failed. A quick look at the states that have joined this legally dubious effort shows that the effort is entirely one-sided—the compact has been made law in Maryland, New Jersey, Illinois, Hawaii, Washington, Massachusetts, Vermont, California, Rhode Island, New York, and Connecticut, as well as the District of Columbia. None of these states have voted Republican in a presidential election since at least 1988. In fact, D.C. has never voted Republican, and Hawaii has done so only twice. The addition of Colorado will mark the first time that anything close to a swing state has joined the compact—Colorado voted Republican in 2004, and favored Hillary Clinton by less than 5 percent in 2016. A narrowly partisan change to the Constitution is not likely to pass, nor should it. The changes to the Electoral College made in the 1804 and 1961 amendments had widespread support around the country, and corrected problems that nearly everyone agreed were problems. The NPVIC does not seek to remedy such an ill; it seeks victory for one side through changes in the law. “Read literally.” What other way should a law be read? Do the NPVIC’s advocates think the language is metaphorical? Do they suppose the Constitution’s authors were being whimsical when they wrote this phrase? Even originalists can admit that some passages in the Constitution are vague, but to read the words any way other than literally invites us to have no standard at all. This is taken as evidence in the NPVIC’s favor, but it is more naturally read the other way. Even if the carve-out invented in Virginia v. Tennessee remains good law, it suggests only that minor agreements with no effect on the union as a whole should be exempt from congressional approval. The exact contours of the Virginia-Tennessee border (the subject of that case) do not change the balance of power between the states and the federal government. While important to people living along that state line, it has no federal implications and is hardly even a compact; it is merely the clarification of an earlier (in this case, colonial) agreement on a physical boundary. Compare that to the NPVIC, which effectively rewrites an entire section of the Constitution. The compromises struck at Philadelphia in 1787 were not made lightly. Decisions on how the president would be elected and how many votes each state would get are the product of lengthy negotiations and trade-offs. To overturn those arrangements based on the alliance of a few states—likely not even a majority of them—turns that finely balanced design on its head. Other constitutional objections could also hinder the NPVIC. One of the biggest issues is that, while claiming to value all Americans’ right to vote for president, the compact has the effect of disenfranchising each state’s citizens. In layman’s terms: if any state denies the right of adult male citizens to vote, that state’s representation in the House of Representatives will be reduced in proportion to the percentage of such men who were disenfranchised. That is, if the state of Louisiana—which was 50.1 percent black in 1870—had refused to allow its black citizens to vote, the number of representatives Louisiana could send to Congress would be reduced by 50.1 percent. Despite widespread black disenfranchisement in the South following the end of Reconstruction, this provision was never enforced. It nevertheless remains valid law, and the read together with the Nineteenth and Twenty-Sixth Amendments, it would likely prevent the disenfranchisement of any citizen aged 18 or older. The Congress that passed this amendment sought to protect the former slaves from being deprived of the right to vote; they never imagined that a state would someday attempt to disenfranchise all of its citizens. Yet that is clearly what the NPVIC threatens to do in removing the right to vote for electors for president. If the nationwide vote is won by a candidate other than the one who won in that state, the state’s electors would nevertheless vote for that candidate. This would sever the connection between the voters and the electors, disenfranchising the people and jeopardizing the state’s representation in the House. Even if the NPVIC were constitutional, and even if enough states joined it to bring it into effect, there is no guarantee that the result would suit Democrats any better than the current system. We don’t know who would have won a national popular vote contest in 2016 because no one, at present, has ever tried to win one. Could Trump have gotten more votes out of California if his campaign had spent time and resources there to get out the vote? Of course he could, but it would not have been enough to overcome Clinton’s massive advantage there, so they did not bother. At the same time, many conservative Californians likely sat home, knowing their votes would not tip the state to Trump. This is the heart of the NPVIC advocates’ case for a popular vote, yet they fail to see how it cuts against them just as much. We don’t know who would win a national popular vote, because we’ve never really had one. Losing two elections in the Electoral College despite popular vote pluralities is bound to frustrate partisans on the left, and it has seemingly driven some of them to embrace radical, nonsensical solutions. Emotions run high in electoral politics, but they cannot overcome the truth of what the Constitution does and does not allow. Proponents of a popular vote are free to amend the Constitution if they can but until they do so, they must respect the rule of law and accept the results of elections. Check out all the different GOP groups, opportunities and resources at the GOP Action Center. Get involved! February marked the 7th straight month of 3% or better wage growth as gains reached 3.4%, the best in a decade. This was “hugely positive,” and “easily the best of the economic recovery that began nearly 10 years ago,” beating economists’ predictions of 3.2 percent wage growth. The national unemployment rate remained at or below 4% for the 12 th straight month in February, and groups who have historically suffered from high employment like non-high school grads and Hispanic-Americans saw record low unemployment rates. The unemployment rate for Hispanic-American reached a new record low. 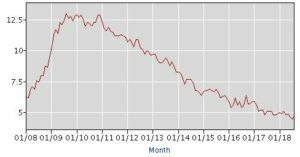 The labor force participation rate remained at a 5 year high as Americans left behind by President Obama are flooding back into the labor market thanks to President Trump’s pro-worker policies. President Trump’s booming economy has brought a “sizable” number of Americans, particularly women, back into the labor market, reversing the “alarming” exodus of workers that occurred under President Obama. These are amended notes from a discussion that we had at our October SCRW meeting. We encourage our members and friends to continue to research and ask questions before casting your vote on Tuesday, November 6, 2018. We’ve also included the recommendations from the Centennial Institute 2018 Voter Guide. Here is a summary from the members present who provided their opinions. CI is neutral on this one. Proposition 112 pros & cons thorough review presented by Debra Irvine. Y and Z Y is Congressional redistricting and Z is legislative redistricting & the ones our group did not agree on. A nonpartisan staff will be selected to include 4 Democrats, 4 Republicans & 4 Unaffiliated. 8 of the 12 must approve the redistricting map. Per Kim McGahey it depends on who is in power; if the Democrats like they are now, Vote YES (Kim) but if Republicans are in power, vote NO. Per Debra Irvine, Vote NO. Not so cut and dry; need to do more of your own research! This amendment is in response to Proposition 112 so it offsets; Vote NO on 112 and YES on this one just in case 112 does pass. Property value will be harmed by government action. Outside Democratic supporting groups spend more than the Republicans right now. Funds four local initiatives: wildfire mitigation, mental health & suicide prevention, infrastructure repairs, early childhood education, recycling and waste diversion. Though these are admirable causes, this is a big bill that the county commissioners are trying to push through. There have been many letters to the editor on this topic, urging a No vote to force the county to split these issues into separate bills and be more transparent about how the money would be spent. Fact Sheet – Booming Economy under President Trump! The Economy is booming under President Trump and the Republican Party, creating jobs, wage growth, and personal wealth. The unemployment rate was at 3.9 percent in August. The unemployment rates for Hispanics/Latinos, Blacks, and Asians are the lowest in history. Among the major worker groups, the unemployment rates for adult men (3.5 percent), adult women (3.6 percent), teenagers (12.8 percent), Whites (3.4 percent), Blacks (6.3 percent), Asians (3.0 percent) and Hispanics (4.7 percent). The Dow Jones Industrial Average hit record highs more than 80 times under President Trump/Republicans, including closing higher than 26,000 points for the first time in history. This benefits most individual retirement plans, pension plans, and individual investors. President Trump signed an Executive Order that expanded apprenticeships, recognizing the need for more quality alternatives to four-year college degrees. The Executive Order set in motion a new process that makes it easier for businesses to create apprenticeship programs, providing many more Americans access to an affordable education that leads to a well-paying job. The Trump Administration prioritized the economic empowerment of women as a key element of its commitment to economic growth and gender equality. This year, the Small Business Administration loaned approximately $500 million more than last year in capital to women-owned businesses. President Trump has rolled back unnecessary job-killing regulations. In 2017, President Trump far exceeded his promise to eliminate regulations at a two-to-one ratio, issuing 22 deregulatory actions for every new regulatory action. This has led to business growth and jobs. Over 500 companies have announced bonuses, wage increases, and new investments. More than 4.8 million workers received increased wages or bonuses (3.7 percent of all private workers). President Trump and the Republican Party are unleashing economic growth and jobs. During Trump’s first year, nearly 3 million new jobs were created since January 2017 and the unemployment rate fell to 3.8 percent, the first time below 4 percent in 18 years. The manufacturing industry has created more than 300,000 jobs. The number of people dependent on food stamps has fallen by 2.6 million or 6.2 percent since January 2017. The U.S. Gross Domestic Product (GDP) has averaged 3 percent growth the last three quarters. At the end of July, it was 4.2 percent. Under President Obama, GDP averaged 1.9 percent. The unemployment rate remained at 3.9 percent in August. The number of long-term unemployed (those jobless for 27 weeks or more) is 1.3 million. Over the year, the number of long-term unemployed has declined by 403,000. Professional and business service added 519,000 jobs over the year. Health care has added 301,000 jobs over the year. Wholesale trade employment increase by 99,000 over the year. Employment in transportation and warehousing rose by 173,000 over the past 12 months. 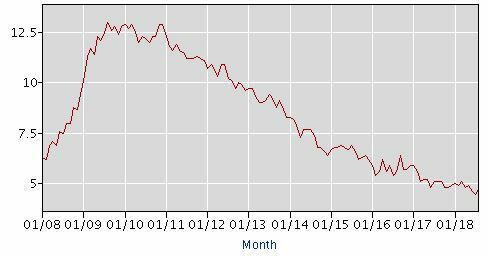 Mining employment has added 104,000 since October 2016, almost entirely in support activities for mining. Employment in construction has increased by 297,000 over the year. Average hourly earnings for all employees on private nonfarm payrolls has increased by 77 cents or 2.9 percent.